Having a one-year-old son who is already fascinated by the magic of technology and desperate, given a few minutes, to delete all the apps on my phone – I am realistic about the world in which we live. People want things new, fast and cheap and often, as they perceive it, better. They don’t always care where it comes from, or have any loyalty about where they spend their money. When clients looking for a new accountant or tax expert approach me and their main concern is simply price, I am not afraid to tell them we are probably not going to be the cheapest. We are a small firm, we don’t fob people off with always dealing with some unqualified junior, and unlike many of the firms around here we have not been bought out time and again growing bigger and bigger while getting less and less local. Also, in many cases if their only concern is doing the bare minimum and churning out accounts / tax / VAT returns without thinking of the bigger picture then again, we are probably not for them, as we offer a much more comprehensive service. We don’t just want our clients to survive; we want them to thrive! We offer as much advice and support as we can which means regular reviews and good tax planning. Mindful of costs, we welcome work from people who do their own book keeping and accounts and just come to us for the final service. But that doesn’t mean we won’t check and correct their book keeping work if needed. And whilst you would think people welcome that, some don’t want to pay for it. But getting it right helps prevents even bigger and potentially more costly outcomes. It is about seeing the whole picture. It’s a sad fact that in an economic downturn, people don’t stop eating meals out but turn instead to consuming cheap fast food such as burgers and it is the big chain restaurants that benefit most. If people can’t afford their weekly meal at a local pub they replace it with a weekly fast food meal, which is probably cheaper but only if you are not seeing the bigger picture. A meal out, a good meal out, is so much more than just something to fill your stomach and actually people are often wrong about the perceptions of true costs / savings by not supporting small quality local restaurants which use local ingredients and in turn help to support local. 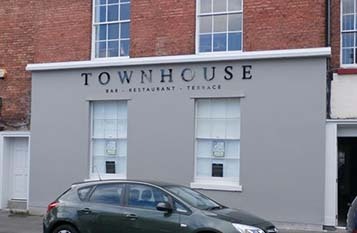 I was lucky enough to have been taken out for lunch by a client recently who treated me to a meal at theTownhouse in Willow Street, Oswestry, close to our office. None of us had been in there before and I was somewhat apprehensive it would be an expensive meal for my generous client to buy me, leaving me to desperately search for the cheapest thing on the menu. With a very tidy outward appearance, a lovely comfortable interior and a sophisticated feel, everything about the place suggests pricey. But once you step inside you soon realise it is not about expense it is about quality, attention to detail and most importantly great customer service. They are also aware of the potential customer’s perceptions. As a good local business keen to attract lunchtime trade they introduced a bar menu and the opportunity to offer food such as the Townhouse 8oz Burger, bacon, cheese, brioche, triple cooked chips for under £10. I have had occasion to return to the Townhouse twice since I first discovered it. Once was to take Carol, my chief number cruncher and her husband out to a thank you for putting up with me Christmas meal. The second was actually on my birthday when having met friends with two children under two at a soft play park we wanted to treat ourselves to a quality lunch at a more grown up quiet place afterwards. When you have really young children you are often made to feel you should only frequent noisy family run places with children’s menus that only serve food covered in breadcrumbs and fried. But we could not have felt more welcome and the calm surrounding was enough to send our one-year-old off into a deep sleep after he tried some suitable parts of my lunch. As our two-year-old guest put it, ‘Mummy these burgers are just so yummy, they are just so yummy.’ And she was absolutely right. Perfectly seasoned, perfectly cooked, well presented and served with something far too tasty to be called a chip. I’m sure there is a more sophisticated way of putting it but I don’t think you will find a more apt word than ‘yummy’ to sum up the food they serve. The portions at theTownhouse may be smaller than some people are used to but you get plenty to eat (and share with a small child). I would always take quality over quantity and I don’t enjoy seeing food waste. It is not ethical or responsible and a pile of food I will never finish is not value to me it is more of a marathon – I know I will never finish and will end up feeling guilty about it. Besides which, if you do still have room, then dessert is amazing and served with such attention to detail. The brownies and the doughnuts are both great and everything on the menu us very well thought out. With a young son and a wife who is running a new business too, we are not in a financial position to be spending a fortune eating out on a weekly basis. But I know all things considered you simply cannot compare a burger in a fast food chain with a mouth-watering delight at theTownhouse – and I am the sort of person who would rather eat out just once or twice a month but really enjoy it as more than just a meal, but a relaxing and sociable experience somewhere local. They have created a warm, relaxed but exciting atmosphere with a tasteful, quirky but comfy interior, so you feel you could be in London or Paris as much as back in good old Oswestry! If you like your accounts and tax advice served lukewarm and churned out quickly but cheaply with no attention to detail, no personality, and little customer service where someone junior deals with you, then Welch & Ellis may not be for you. But if you appreciate you get what you pay for (and with us you get much more), then we would be delighted to take you on board and maybe seal the deal over lunch – somewhere local of course. I would be more than happy to suggest we wander down Willow Street in Oswestry for the Townhouse.